Lagavulin single malt scotch whiskey has been made since at least 1816, on the Islay islands of Scotland, and is known for being one of the premiere brands of scotch whiskey. It has a strong smoky peat nose with a deep, rich sweetness and an elegant finish with salt and seaweed. The standard Lagavulin label is the 16 year-old single malt, and there are also 12- and 25-year-old labels available. Prices typically range from $65 to $300. Pour 1 to 2 ounces of Lagavulin scotch into a tulip-shaped glass with a stem you can hold. Do not hold the glass itself because this will warm the scotch. 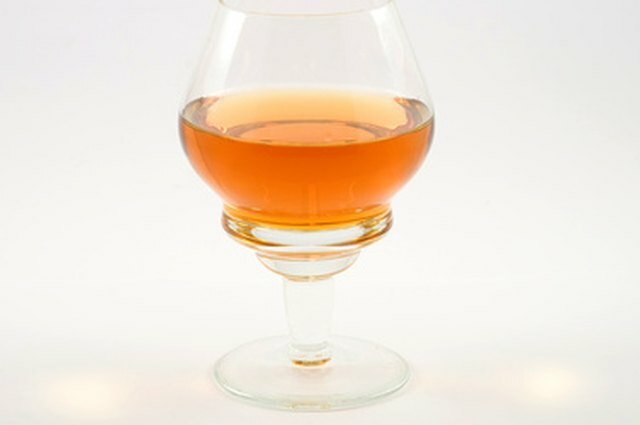 Swirl the whisky gently in the glass, holding it at an angle. Then hold the glass straight and watch as the liquid runs down the inside of the glass. An older whisky will move slower. Pass the glass under your nose in a smooth motion, taking a deep breath in. Do this a few times and note the different aromas you can detect. Form a spoon-shape with your tongue and take a small sip, allowing the whisky to rest on your tongue. Savor the taste and try to isolate particular aromas and flavors. Add Scottish spring water if you wish, but no more than 20 percent of the total amount of liquid in the glass should be water. 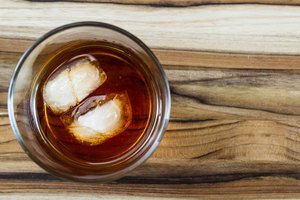 Room-temperature water can bring out the hidden aromas and flavors of the whisky, and make it more mellow and easy to drink. Adding ice to single malt whisky is not recommended as it can dull the flavor and aroma. 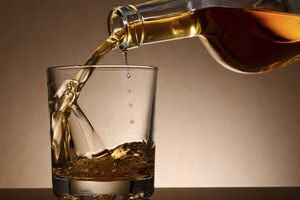 Likewise, using single malt whisky for mixed drinks is considered a waste of quality liquor. Blended scotch is recommended for mixes.